Born in Saskatoon, Saskatchewan in 1928, Shirley Campbell presently lives on a ranch in Southern Alberta with her daughter and son in law Greg and Lynda Baxter. In the mid 1940's Shirley took drawing classes with Ernest Lindner who suggested she should be an art teacher. She has done projects for western shows, cartooning, and oil painting for many years. 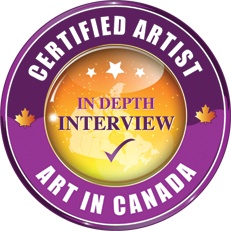 Her favourite subjects are portraits, animals, seascapes and landscapes. I have always had a creative side. In high school I would help the drama department with painting the set designs and I did the art for their programs. In our year book they put "Shirley Graham, artist renowned, best we've ever had around." That made me feel good! I get a feeling of satisfaction, and when I get that feeling, I sign my name and call it done. I try not to over paint, but sometimes I do. I have many reference photographs that I've collected throughout my life. I'm always amazed at the beauty in this world and can be inspired to paint at any moment by my surroundings. I love painting wildlife and can see deer from my window. The thing I like best is to be able to capture a feeling on a human portrait or wildlife painting. I have an art studio in my home. Though my favourite place to paint over the years is at the same dining room table I've had for the last 52 years. It's comfortable for me to be able to spread my oil paints out and come and go as I please. I love to paint in oils. I have also done chalk pastels. I really like working with pastels and would like to experiment some more with them. I love the soft effect I can achieve. I took lessons in Saskatoon in drawing with Ernest Lindner in the mid 1940's. He encouraged me and felt I should consider becoming an art teacher because I had a distinct style. I like to paint on my own and have learned how to paint in oils by trial and error. I have never painted outside. I never had the desire to. I suppose after living in some very cold places in Canada, such as Saskatoon, Regina, Winnipeg and Toronto, environmental challenges would have been the worst for me. Over the years, I have painted many gifts for friends. I like to know that I've left some of my art with friends in the many places we've lived over the years. "If God gives you a talent you should do something with it". Those words were said to me many years ago by a good friend, and inspired me to start painting again. I admire Andrew Kiss's art. I first saw his work in Calgary in the late 80's and completely fell in love with his wildlife artwork. I bought some of his art for gifts, and had the opportunity many years later to meet him in person. I also admire Robert Bateman. I've collected his books and have had them all signed by him. I'm not a professional artist, but certainly was inspired by both Andrew Kiss and Robert Bateman. Their attention to detail is what is so captivating to me in the wildlife art they do. Mixing colours is my biggest challenge. I love to draw and find drawing easy for me. My advice to any artist, who wants to start painting, would be to take some art classes to learn the fundamentals. 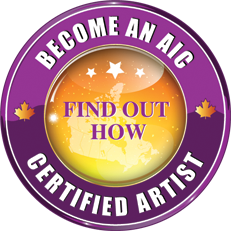 There are so many great workshops put on now by many professional artists. That would be my first suggestion. My second would be once you start... Stick with it! Because I paint for my own enjoyment, and not for my lively hood, I can relax and find pleasure in painting, knowing I don’t have to compete in the art industry. In my studio right now, I would be lost without good paint brushes! To date, the ocean scene I painted in 1971 is still among my favourites. I've painted that same scene for friends in four different colours. I also like the old Woodman which I did when I was 86 for my daughter! 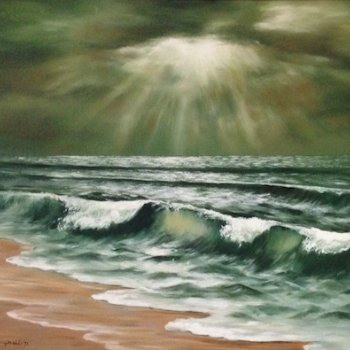 The most well received art to date that I have created is my ocean scene, and my wildlife art. I like visiting Avenida Galleries in Calgary. I like their selection of artists and the overall atmosphere is very nice. I’ve been to the Louve in Paris and to many art galleries across Europe, all of which were very exciting for me to be in, viewing art by the great masters.